You're in for a treat at this spacious Vallejo hotel where the best the Golden State has to offer is right outside your door. Six Flags Discovery Kingdom is our neighbor, which means that you simply have to stroll across the street for a day full of fun. Want something a little more laid back? Napa Valley is also nearby, so an afternoon of wine tasting is an absolute must. This Vallejo hotel is only 15 minutes away from Napa Valley, so a cab ride is an easy choice. 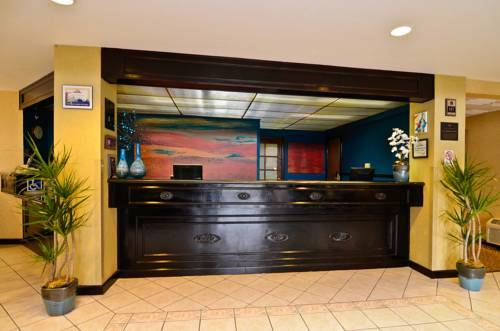 We're the best hotel in Vallejo for adventure seekers. The heated outdoor pool and hot tub is open year round for a little relaxation after a day of exploration. Free parking and free shuttle service to Six Flags Discovery Kingdom are just a couple of the ways guests are treated like family. No other Vallejo hotel can compare. If you're interested in something a little different, you're in luck. Our Vallejo hotel is near several dog shows at Solano County Fairgrounds and the Jelly Belly Factory. This is one unusual match that really works. Speed lovers delight at the NASCAR and Indy Grand Prix at Infineon Raceway. Of course, sometimes you're traveling on business. Maybe you're taking your high school senior to check out Touro University. Maybe you're in town with Valero Oil Refinery, Chevron Oil Refinery, or have business to take care of on Mare Island. Maybe you need to host a business meeting or event in our convenient business room. There's no reason you can't fully enjoy your stay just because you're punching the clock or writing tuition checks. Enjoy a full breakfast before starting your day - it's on us. Book a spacious room at BEST WESTERN Inn & Suites at Discovery Kingdom for an absolutely wonderful vacation! From: Interstate 80. Travel to Highway 37, go west on Highway 37 to Fairgrounds Drive and north on Fairgrounds Drive to the BEST WESTERN Inn & Suites at Discovery Kingdom. Vallejo Naval and Historical Museum,3.00 mile(s) from Vallejo Naval and Historical Museum, Mare Island artifacts museum.